Here in NYC, despite a mean streak of rainy days, the temperatures have been unseasonably warm and the air is filled with a faint but lovely smell of spring. Though I don't trust Mother Nature not to hurl another blizzard our way (it is only February 25th! ), it's been nice to shed some layers and consider the possibility that the dark and cold winter is ending. These spring vibes go perfectly with the arrival of spring blooms at all the bodegas and sidewalk flower shops (a favorite NYC-ism of mine!) and even my beloved Trader Joe's is looking spring-ified! 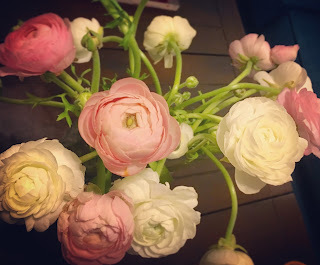 Since we all know that fresh flowers improve your mood, I thought I'd share some of my tips and tricks for always having beautiful blooms on a budget! - put a penny in it! 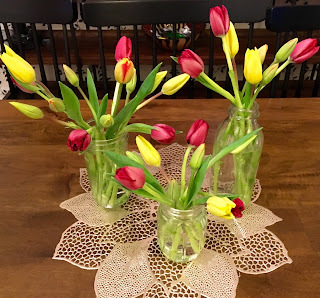 Seriously, if you want your tulips to stay standing for longer and bloom more boldly, put a penny in the bottom of the vase. I don't know why, but it works! - think about a variety of size, color and texture, even if you're only buying 2 blooms to combine. If you're buying different flowers, mix big and bold with something small and soft. - consider an unusual vessel. It doesn't always have to be a vase, maybe it's a cool jar or 2 or 3 small vessels placed next to one another in an "arrangement of arrangements". Though it's tempting to purchase a bundle of flowers that's in full bloom, unless you are in need of a pretty display immediately, resist the urge. Buying flowers that are mostly unbloomed means they are fresher and if well cared for will literally blossom before your eyes. Not only is it fun to watch the flowers "perform" but it means they'll stay lovely on your table for a few days longer than if they were already in full bloom when you bought them.